Concrete is one of the most widely used of all building materials — and for good reason. Not only is it relatively inexpensive, but it also possesses a durability and lifespan second to none. However, things can still go wrong for a concrete surface. This is especially true of concrete containing rebar rods and other types of metal reinforcement. Such metal is used to bolster the internal strength and stability of concrete. Yet as the metal begins to corrode, it can cause problems for the concrete, including cracks, spalling or even outright failure. 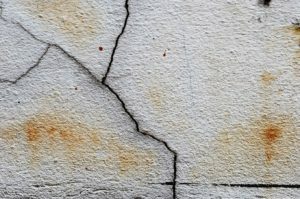 If you would like to learn more about concrete corrosion and what can be done to prevent it, read on. This article will provide a useful overview of the subject. Initially, concrete provides a good degree of protection against corrosion because concrete has a naturally high pH. As a result, concrete tends to form what is known as a passive film on the outside of any steel reinforcing agents. This film acts to protect the metal against the oxygen and acids that lead to the formation of rust. Over time, concrete tends to lose its ability to protect those steel elements. There are two main reasons for this protective decline. The first is that the pH of the concrete will gradually go down over time as a result of carbon dioxide interacting with the concrete and causing it to begin changing on a chemical level. Salts gradually penetrating into the pores of the concrete also decreases the protective passive film. These salts — which come from rainwater, de-icing substance and even the air itself — contain substances known as chlorides. As these percolate down through the concrete, they eventually reach the steel elements. There they eat away at the steel, causing pitting, corrosion and rust. The key problem with corrosion in the internal steel reinforcing elements is that, as corrosion begins to set into the surface of the steel, rust starts to form. That rust then increases the overall size of the reinforcing element. When the steel is expanding because of rust, it can cause problems because there is no room for the steel to safely expand. It’s surrounded on all sides by hard, dense, fully-formed concrete. As corrosion and rust continue to build up on the steel, they exert a greater a greater degree of pressure on the concrete. This pressure ultimately leads to the formation of cracks and what is known as spalling. Spalling refers to the chipping, flaking and loss of concrete on the surface of the slab. What happens is that the internal pressure being exerted by the corrosion makes the surface more susceptible to damage. Spalling ruins the concrete’s appearance while also making it less safe to walk on. The pits and craters that form also allow water to build up on the surface, hastening the rate of further degradation and wear. Prevention will always be easier and less expensive than repair. You should spend more for reinforcing agents that will act to minimize the likelihood of corrosion. This generally means investing in rebar that has been coated with an impermeable layer of epoxy, thus making it resistant to corrosion. Installing a concrete surface is a huge investment — one that must be taken seriously. While it is a step in the right direction to utilize reinforcing agents such as rebar, that isn’t always enough to prevent corrosion related issues. For more information about how to protect your concrete against internal corrosion so it will last longer, please don’t hesitate to contact the experts at Advanced Post-Tension, LLC.